5 Ukulele Christmas Songs for you to play! 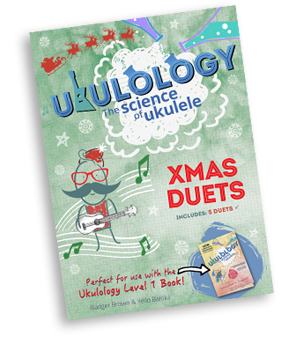 There are lots of ukulele Christmas songs kicking around the internet, but not that many ukulele duets! So we thought we’d make some special 2-part arrangements for you to play at Christmas time with your friends & family. Some of these ukulele Christmas songs are relatively easy, and some very challenging, using jazzy chords (e.g. Amaj7, E9, Bm7) and interesting strumming patterns. We’ve worked hard to make these ukulele Christmas songs sound great, and be challenging enough to give you an opportunity to progress your ukulele skills (e.g. they contain many interesting chords that you may not have played before). 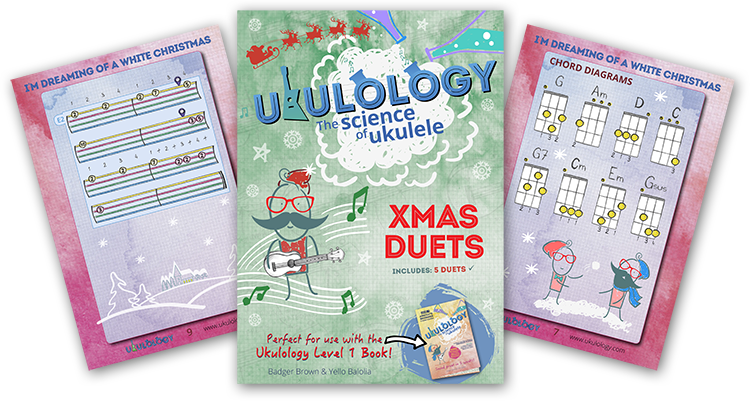 These ukulele Christmas songs also provide a good chance to practice techniques taught in the Ukulology Level 1 book, such as tablature, chord charts, divided beats, positions, section endings, swing feel, fills, and syncopation. Take your time learning each song. Some may seem very difficult at first, but with practice and patience, you may be surprised at your progress. Play through the Chord Diagrams for the piece you are learning, and practice new or challenging chords until they become easy for you. When playing the Chords part, notice any difficult chord changes and practice them in isolation until you achieve smooth, effortless transitions. For challenging rhythms, count slowly out loud, carefully placing the notes where they are intended to be. Repeat this until you have internalised the sound of the rhythm before playing it in the context of the whole piece. Once you are familiar with the ukulele Christmas songs, why not do a performance on Christmas day for your family? Ho ho ho! To download our 5 FREE Ukulele Christmas Songs, simply fill in the form in the green box for instant access (you’ll also receive 10 other useful ukulele PDFs!). Simply fill in the form to receive the 5 Ukulele Christmas Songs PDF! Simply fill in the form to access all our free ukulele resources! This entitles you to our fantastic newsletters with useful ukulele tips and special offers. You can unsubscribe at any time.